iCash is a software intended to control your personal finances, keeping track of incomes, expenses, credits, debts and Banks transactions for you. As simple as creating the accounts you need and move money between them! You don't even need to know about accounting or even care about it! Your finances depend largely on good organization that lets you know where your money comes from and to where it goes. 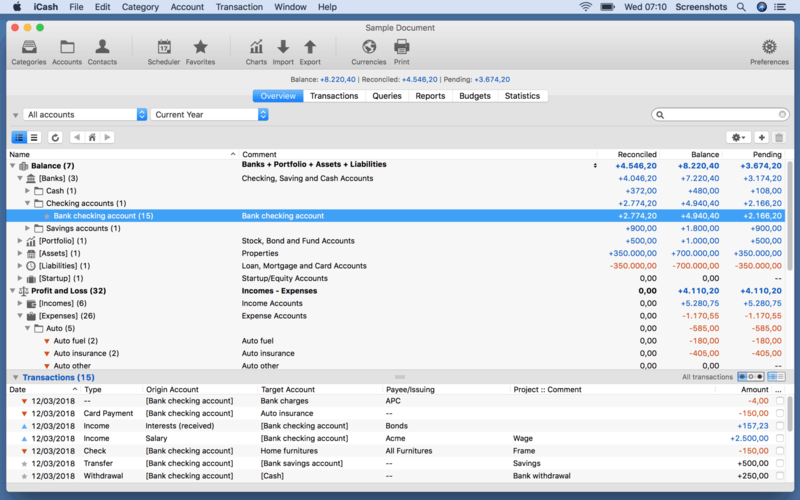 iCash is an easy-to-use, full featured and multi-purpose Personal Finance Software for macOS and MS Windows intended to help you control all kinds of money issues. It can serve several small accounting needs for either private users, or clubs, associations, self-employed, small businesses or simply to be used at home, making keeping track of incomes, expenses and Banks transactions a snap. With a few clicks you can begin creating accounts and making transactions in minutes. QUERIES - Thanks to its advanced SQL engine and its Queries editor iCash offers the possibility to search any information from a document in seconds. Results can be printed or exported to a file. REPORTS - iCash lets you create, print and export several types of reports, the Balance sheet, the Profit and loss statement, the Profit and loss summary, the Account Statement and the Tax report. 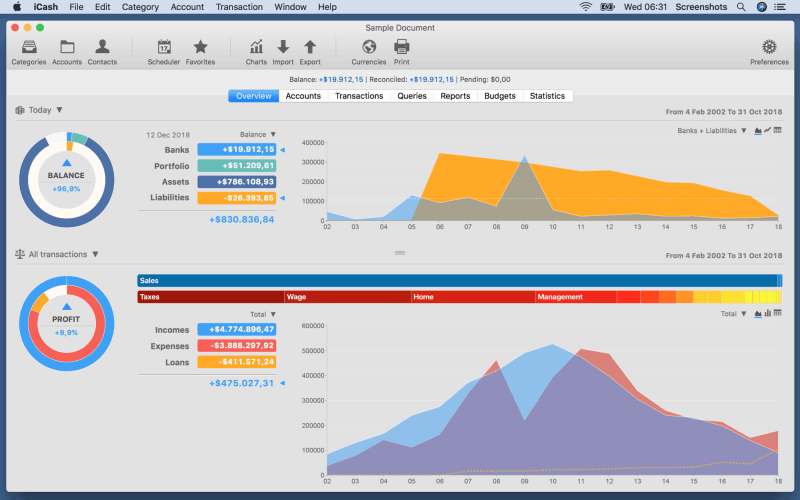 CHARTS - iCash offers 3 types of charts, Line, Bars and Pie. 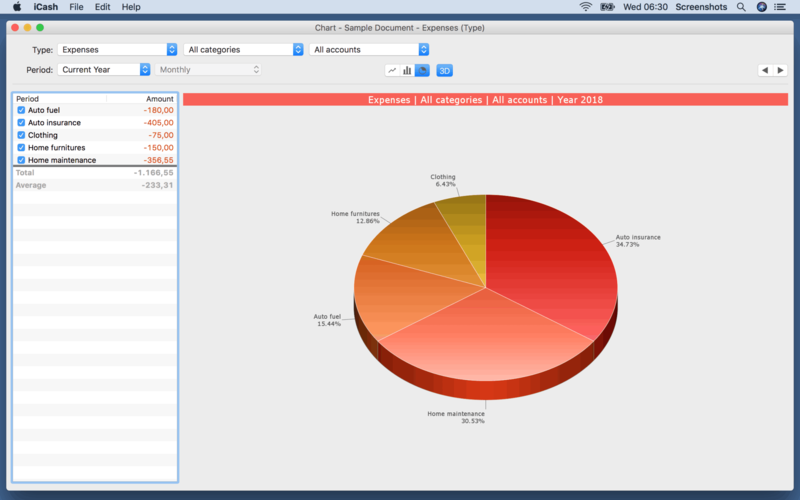 Line and bar charts are intended to display the evolution of an account or a group of accounts over the time whilst the pie chart simply shows ratios allowing you to visually compare accounts or categories of the same type. 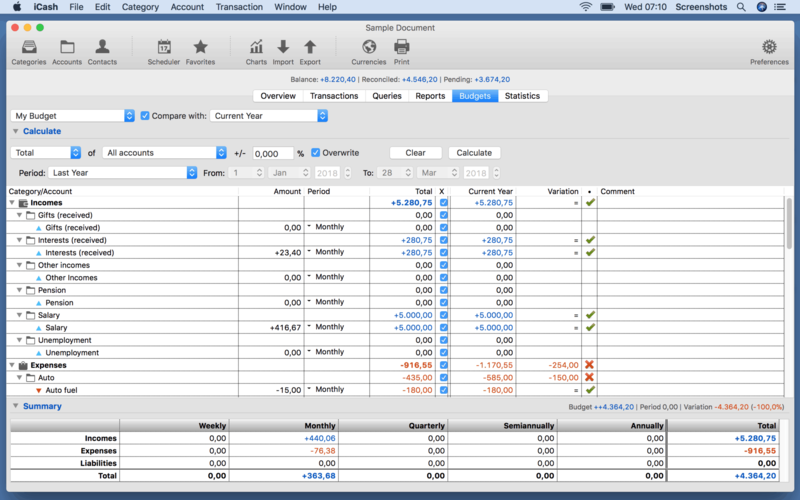 BUDGETS - iCash offers the possibility to create unlimited Budgets, a feature designed to replace cumbersome and error-prone spreadsheets. It is possible to take advantage of the data you have been typing in iCash so far in order to create a budget. 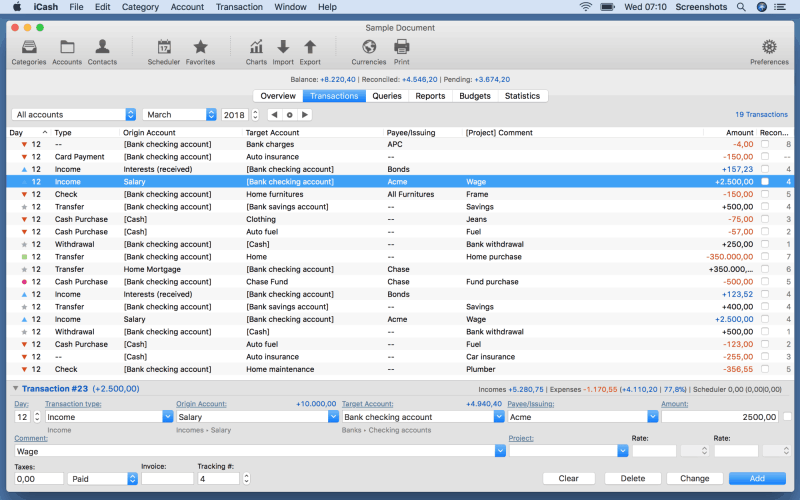 SCHEDULER - iCash includes a Scheduler that lets you create scheduled or recurring transactions. 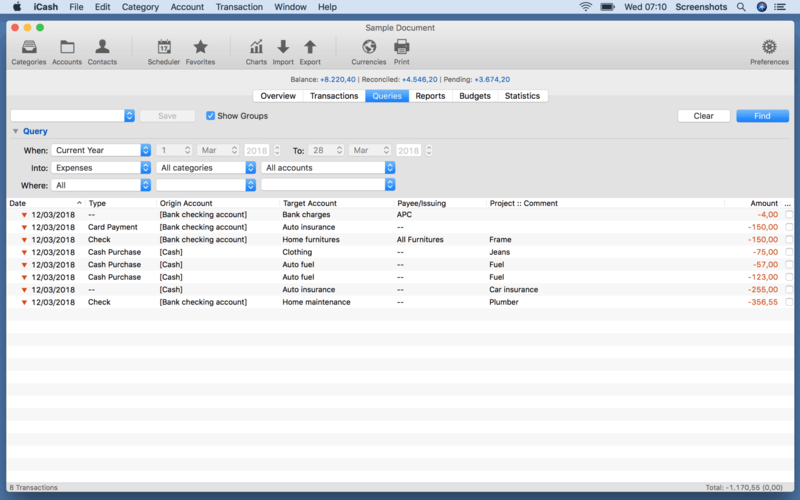 Recurring transactions can be configured to stop after a certain period or repetitions. Scheduled transactions are made to help entering repetitive money operations, like subscriptions, insurances or taxes. CURRENCIES - iCash lets you mix accounts in different currencies throughout the application. If you are connected to the internet, you can keep all your currency exchange rates updated. 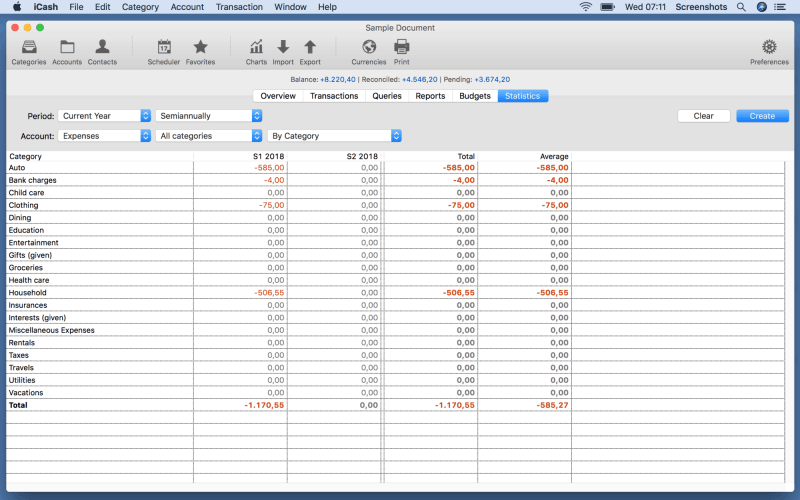 QIF & OFX - iCash supports the Quicken QIF and the OFX (Open Financial eXchange) formats. QIF and OFX are very common as the online Banks preferred export formats. PROJECTS - A project is a label that allows you to mark related transactions in order to perform queries later using that label. You can for example mark a group of transactions as your home improvements and then use the query panel to display them all. Nice, Clean App! - "I'm happy to use iCash for years now. It's getting better with every update and it's worth the price. It's very simple to use and setup and I'm sure using this application to monitor all my money has saved me more than just the price for the app." The most cost effective and easiest solution - "I bought iCash some time ago and use it ever since for my private account. It´s easy to use - I didn´t even read the small manual, but was nonetheless able to set up my accounts needed and do transactions and analysis. This is mostly because the interface is clear and easy understandable. I´d recommend it for private users and small businesses." I've used iCash for several years now, and it's been a very reliable tool - "An excellent application. I have used iCash since v1.0 and found some necessary items that were missing. Maxprog has been very good with their support and keeping me up to date on changes to the system. 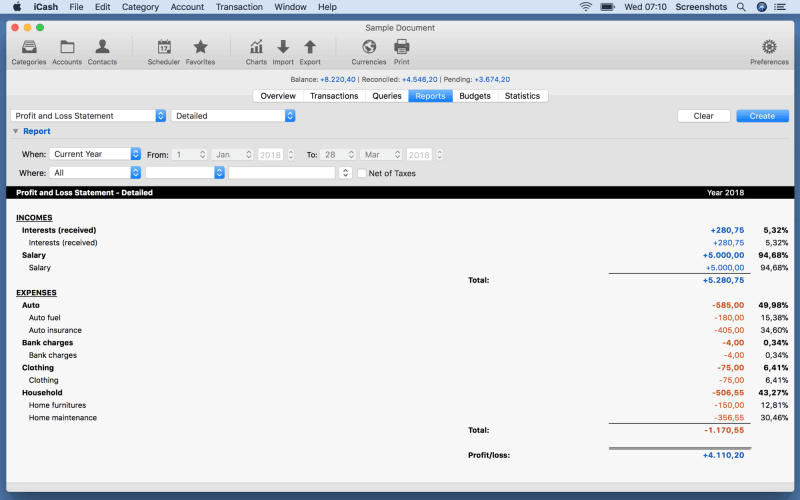 v1.1 added report printing and v1.2 should add QIF support. Otherwise the features, easy of use, and other functions of this application make it a must have low cost personal financial solution. It would also be suitable to small and medium size business." This software saved my business! - "A very good product. I looked at all the alternatives trialling each of them over some weeks. iCash was the most comprehensible and very mature for an early (i.e. v 1.1) release. I am not an accountant and if your like me you'll probably appreciate the ease of use." A real and powerful software - "I tried a lot of products including iCash and seemed drawn toward iCash for its more comprehensive reports and stats. I feel most products are more based on displaying the balance of your bank account whereas iCash tries to show the bigger picture of income/expenditure. Maybe I'm wrong. I'm a newbie at accounts. But it sure does the job for me. Now I know why I'm always broke." Feel free to download and try iCash! iCash is being developed and marketed by Max Programming, LLC. also known as Maxprog®. Maxprog is a privately held company based in Spain dedicated to macOS, MS Windows and Linux software development. Max Programming mainly develops and markets Internet, communication and database tools.